Create Big Romance on a Small BudgetTired of the usual dinner-and-a-movie dates? Looking for new ways to connect with your spouse? Energize your marriage by getting out of your normal routine with the help of these 52 creative date ideas. 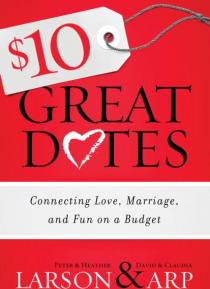 From outdoor dates to out-on-the-town dates, you and your spouse will have no trouble finding the perfect date that fits your mood--all on a $10 budget!See for y… ourself how new experiences can help you bond together and nurture your relationship. Which of these will be the first of your Great Dates?�	Time Travel Great Date�	Moonlight/Sunrise Great Date�	Bucket List Great Date�	Surprise Me! Great DateEach date includes easy preparation suggestions, tips for the date, talking points to enhance your conversations, and a Great Date takeaway. What are you waiting for?